You’ve packed the towels, beach chairs, sand toys and a picnic lunch. Everyone is ready for some fun in the sun on your perfect beach vacation. Your day will be just beach-y if you use an ounce of precaution and prep a beach first aid kit. Arm yourself with some basic knowledge on how to treat sunburn, what to do for a jellyfish sting and why treating cuts on the beach requires special care, and your trip will be a breeze. 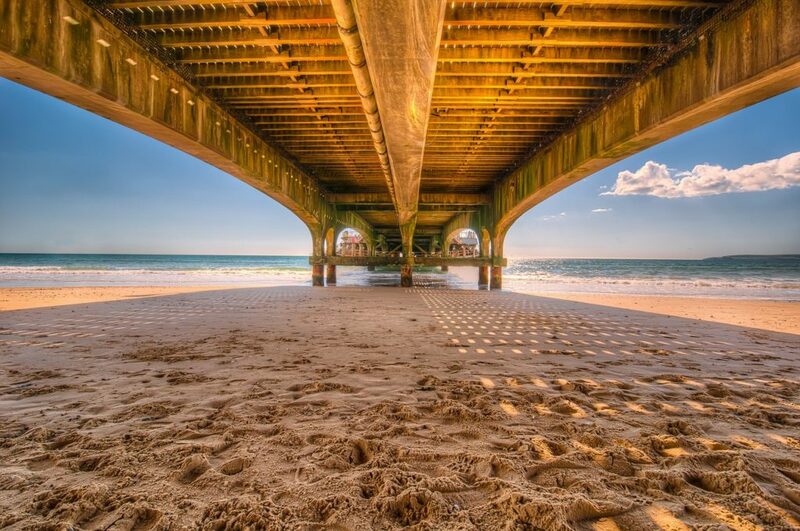 Here’s the deal: every year, approximately 60 million Americans go to the beach. Not to be a Debbie Downer, but when you show up on a large expanse of sand that may include broken glass, crashing waves with undertow, sea creatures, the sun beating down (hello skin cancer) and insects, there is a high likelihood that something will happen to someone on your trip. Risk is everywhere all around us, but some minor prep steps can leave you ready to save the day. 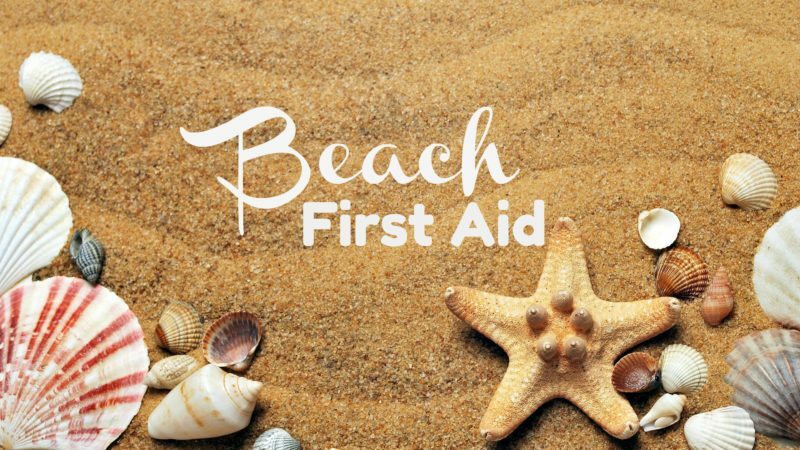 We’re going to cover sunburn treatment, the difference between heat stroke and heat exhaustion, how to treat jellyfish stings, repairing cuts and scrapes, beach insect bite treatment and what to pack in your beach first aid kit. 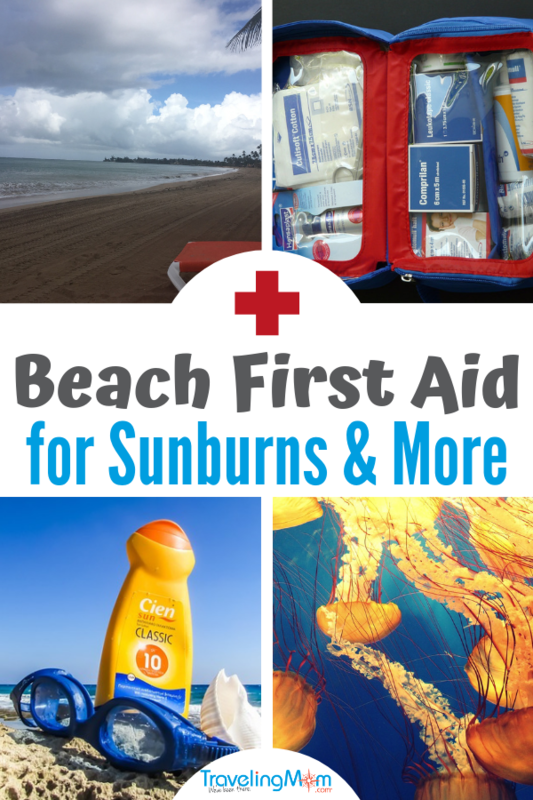 Read on for a list of what you need in your DIY beach first aid kit. Prepare for your beach vacation with our tips and tricks to make sure everything goes smoothly! The vast majority of sunburns are superficial burns (1st degree). They can be painful, but are not usually serious. Your best bet here? Prevention! Too much sun exposure can lead to skin cancer, so this should be a no-brainer anyway. Sunblock on everyone, reapplied regularly. Be sure to follow the instructions and give it time to dry before hitting the waves. I’m a spray-on fan but there is certainly a variety out there for everyone. You won’t need to know how to treat sunburn if you don’t get one in the first place! 1.) Limit sun exposure as much as possible from here on out. Move to a shaded area, stay under an umbrella, or leave the beach altogether. You could also cover up the skin’s surface with protective clothing (there are some very light weight long-sleeved shirts and pants made for this very thing). 2.) If the sun burn is relatively minor (no blisters developing- top layer of your skin only), take a cool bath or cool shower. You can also apply a cool compress to relieve pain. 3.) Liberally apply Aloe Vera gel to the affected area. It will help provide sunburn relief, and aids in the healing process. In a few days when you have peeling skin, keep your mitts off of it to avoid infection. Practice proper skin care and try to avoid anything that could cause skin irritation (lotions, scented products). You may need to utilize an over-the-counter pain reliever for the first day or two. 4.) If the sunburn evolves into a more serious burn (second-degree, as defined by blistering of the skin), DO NOT POP THE BLISTERS. Popping the blisters will only lead to an increased risk of infection. Second degree sunburns take a bit longer to heal and popping the blisters will only prolong healing. Instead, follow the steps above and cover with a clean dry dressing to help protect the area. Over-the-counter pain killers (like Advil or Tylenol) may also be helpful here. If you are sunburned badly enough to develop blisters, it would be a good idea to go see a doctor as this is considerably worse than your average sunburn. 5.) In the highly unlikely event that the sun burn appears to be white and has gone numb to the touch, this is a sign of a VERY bad sunburn and should definitely be evaluated by a physician. DO NOT SCREW AROUND WITH THIS as it could have long lasting and even permanent consequences. See your doctor. Walking around barefoot in the sand can be hazardous, as one could be cut/stabbed/poked by any number of things that were just under the surface of the sand. Broken glass, razor clams (they have the name for a reason) and even just plain old sharp rocks are a few of the hazards lurking under the sand. Most of the time, these cuts and scrapes are exactly that: cuts and scrapes. They may feel worse when they happen at the beach because of all the sand and salt, but at their core they are all the same and should be treated as such. Want to prevent them? 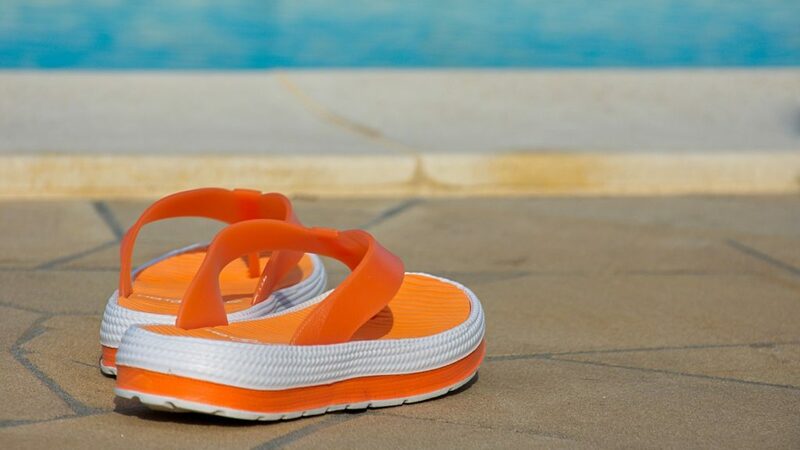 Pack water shoes for your beach vacation and wear them! Yes, they may not be the fashion statement of the century, but we promise they’ll make everyone’s day more pleasant. 1.) Wash away any debris in the effected area with clean water. 2.) If the wound continues to bleed, hold direct pressure with gauze pads or bandage (you did remember your beach first aid kit, right?). 3.) After the bleeding stops, apply an over-the-counter triple antibiotic ointment (such as Neosporin) and bandage the wound appropriately. Antibacterial ointment is important here as bacterial infections are more likely to occur when you get cut at places like the beach, so a little bit of Neosporin now can prevent a whole debacle later on. Personal story here- I got a cut on my foot at the beach when I was in elementary school. It didn’t heal properly and I got a plantar wart. Want a parenting struggle? Take your active 9 year old in to have a wart frozen on the sole of their foot. They had to cut it out after with a scalpel. Eww. Plantar warts are caused by the HPV virus and can easily be picked up if you have a cut and then come into contact with the virus (easy to do in a beach shower or restroom). Wear water shoes folks! 4.) Keep the bandage dry and clean as much as possible, and change when appropriate (just like any other adhesive bandage). If the wound still becomes infected after you have taken appropriate measures to treat it, see your doctor. Though they are rare, there have been some truly nasty infections that have come out of minor cuts that were exposed to sea and pond water. Note: If you observe any black lines developing near the infection site, this is a VERY SERIOUS sign and needs to be seen by a doctor immediately. These infections, if left untreated, can lead to serious problems that have resulted in amputations of limbs and loss of life. Black lines = bad = doctor now, NOT later. You may be chuckling getting ready for pee jokes. We’ve all seen this perpetuated in show after show and movie after movie. Sorry, a jellyfish sting isn’t an excuse to pee on your buddy, as urine is only marginally effective at best with neutralizing the venom. Though jellyfish stings can be painful, a jellyfish sting in and of itself is NOT an emergency. More than 150 million people are stung by jellyfish each year world wide, but only about 50 people die per year as a direct result of jellyfish stings (40 of which are in Australia and the Philippines, and are primarily from a single species called the box jellyfish). 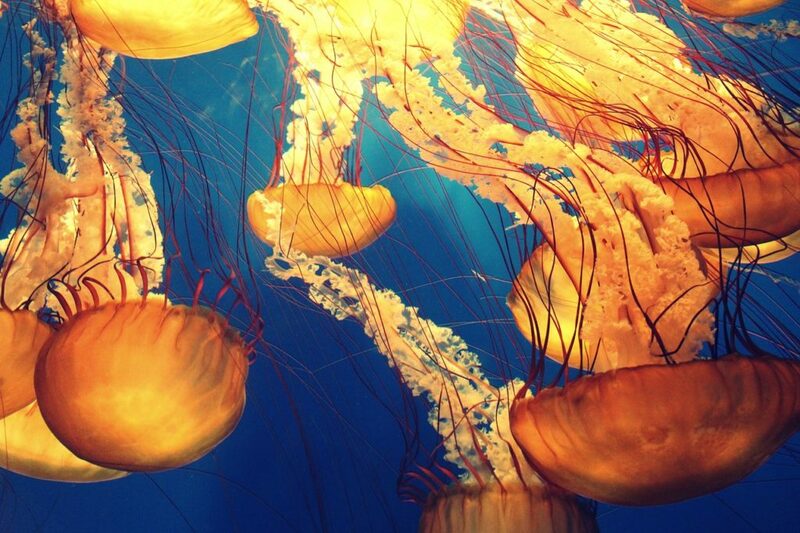 Even the 50 deaths per year statistic is misleading, because it is actually an allergic reaction caused by the jellyfish sting that causes the fatality, not the sting itself. Jellyfish stings are much like a bee sting; the jelly fish leaves little barbs in the skin that continue to pump venom into the skin after the jellyfish has detached itself. 1.) Don’t pee on the victim. Yes, it needs to be said again. 2.) Try to flush away loose stingers with copious amounts of sea water, NOT fresh water. Fresh water has been shown to make the sting worse, not better. 3.) Flush the affected area with white vinegar if it is available. 4.) Remove any remaining barbs with tweezers, or if tweezers are unavailable, use a straight edge like a credit card to scrape them away. 5.) Soak the affected area with warm/hot water for 15-20 minutes (roughly 110 degrees). If you don’t have access to warm water, a hot compress will also work. 6.) After all of this is done, you can use an over-the-counter anti-inflammatory (like ibuprofen) or an instant ice pack to help dull the pain. Calamine lotion can also help. Rest and monitor, but most likely the victim will be okay. In the unlikely event that the person starts to show signs of an allergic reaction, such as difficulty breathing, hives, or abnormal swelling in the face and neck, this would constitute and emergency and medical intervention should be sought immediately. If someone is stung in the eyes, call 911. Seek professional medical care IMMEDIATELY as the eyes are very sensitive and do not respond well to having tiny little barbs in them. This is not something that can be treated in the field. Instead of waxing poetic on signs and symptoms here, I’m going to link you over to a super in-depth article about all heat related illnesses and treatments. Read extensively on heat stroke and heat exhaustion including how to recognize them and treat them over on TravelingDad. Don’t let insects ruin your beach vacation. Bug bites can be a pain with no real “cure.” Try to prevent them in the first place by utilizing bug spray. Sand flea bites are an annoyance and unfortunately can lead to scarring if you scratch them (sadly I learned this lesson the hard way after a Jamaican beach vacation). They may not appear right away. When the initial bite happens, you may see a red bump. That can swell up and become a full fledged itchy hard bump within 24 hours. The best treatment for sand flea bites is painting them with hydrocortisone cream or calamine lotion to soothe the itch. If you have access to a bathtub, oatmeal baths can help. In a pinch, overlapping sunburn treatments such as cool compresses or aloe vera can help. If the itching is intense, try to take an antihistamine like Benadryl. At the risk of sounding silly, wear socks on your hands when you sleep. The bites are itchiest at night for some reason. Treatment for mosquito bites is pretty much the same as for sand fleas. Hydrocortisone itch cream, calamine lotion, cool compress and an antihistamine if you have a lot of itching. While treatment for mosquito and sand flea bites is pretty much restricted to anti-itch cream, bee stings are another story. Traditional bee sting treatment for someone who is not allergic is simple. 1) Remove the stinger immediately. Do NOT squeeze and pull the stinger. It will release more venom. Try scraping it with a credit card. 2) Wash the sting with soap and water. Apply hydrocortisone cream if desired. 3) Apply ice to help with pain. An antihistamine (Claritin/Benadryl) will help with itching and swelling, or an over-the-counter pain reliever (Tylenol or Advil) will help with pain. These can be used with the ice, or on their own. Bee sting allergies come in all shapes and sizes. If after being stung, you notice any of the following- hives, itching, becoming either pale or flush, difficulty breathing, swelling of the throat/tongue, dizziness, vomiting or loss of consciousness- you should assess symptoms. Any symptoms that include anaphylaxis – loss of consciousness, difficulty breathing, vomiting, weak pulse or swelling of the throat/tongue should warrant an immediate call to emergency medical personnel. Take Benadryl if you have any while you are waiting. If you have hives, itching, or excessive swelling around the site of the sting, make note to talk to your doctor to see if you should be prescribed an Epi-pen in the event of future stings. Reactions can worsen in some people with subsequent stings. If anyone in your party has an allergy to bee stings, be sure to pack an Epi-pen. Keep in mind that Epi-pen effectiveness can be altered by temperature. Epi-pens should be stored ideally between 68-77 Fahrenheit. As an Epi-pen carrier who travels a ton, I highly recommend this Frio insulated wallet. It is the only product that was found to consistently maintain the correct temperature! Note: After any sting, cut, scrape, or penetrating injury that occurs outside, you should check to see if you are current on your tetanus booster. These are given every ten years. Any injury that can introduce bacteria puts you at risk for tetanus (lockjaw). It’s a truly terrible disease that is present in a lot of soil and sand. It causes painful muscle contractions that cause difficulty swallowing. Having a well-stocked first aid kit should be an everyday thing. You’d be surprised at how often you’ll use first aid supplies. My husband Greg (a paramedic) has prepared a full post on what to pack in both an everyday first aid kit and a beach first aid kit over on TravelingDad.com. (Click here to read it!) Most of the items (hand sanitizer, gauze pads, ice packs, band-aids) can be easily ordered off of Amazon. So fill up your shopping cart and be prepared for outdoor activities. Make a first aid kit one of your must pack beach essentials and be prepared for any emergency situation.